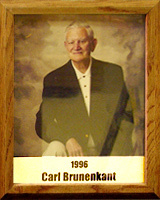 Carl graduated from Union High School in Florence, Arizona, in 1950 after lettering in football (All-State, senior year), basketball and track. On the cinders he’s still part of the school record relay team in the 440 and 880. He earned Bachelor’s and Master’s Degrees from the University of Arizona and began his career in education at Salpointe High School as a biology teacher. He also was head basketball, cross-country and track coach. In 1956 his cross-country team won the first city championship. In 1957 Carl moved to Sunnyside High School where, for the next 28 years, he was teacher, coach, athletic director and principal. In a 15-year span he coached five divisional and two state cross-country championship teams. In 1958 he was appointed the first principal of Desert View High School. After Carl retired from public education, he went to work as athletic director at Salpointe HS where his program has been recognized as one of the best 5A programs in Arizona. Over the past 40 years Carl has been named Athletic Director of the Year; Conquistadore’s Coach of the Year; Director, Arizona Track and Field Foundation; President, State Track Coaches Association; State Director for Arizona Special Olympics; Director, Tucson Youth Football, and President, Sahuaro Little League.